Six million-- a number impossible to visualize. Six million Jews were killed in Europe between the years 1933 and 1945. What can that number mean to us today? We can that number mean to us today? We are told never to forget the Holocaust, but how can we remember something so incomprehensible? We can think, not of the numbers, the statistics, but of the people. For the families torn apart, watching mothers, fathers, children disappear or be slaughtered, the numbers were agonizingly comprehensible. One. Two. Three. Often more. Here are the stories of thode people, recorded in letters and diaries, and in the memories of those who survived. Seen through their eyes, the horror becomes real. We cannot deny it--and we can never forget. 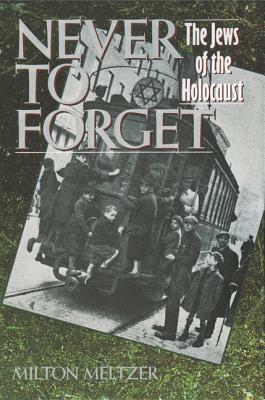 ‘Based on diaries, letters, songs, and history books, a moving account of Jewish suffering in Nazi Germany before and during World War II.’ —Best Books for Young Adults Committee (ALA). ‘A noted historian writes on a subject ignored or glossed over in most texts. . . . Now that youngsters are acquainted with the horrors of slavery, they are more prepared to consider the questions the Holocaust raises for us today.’ —Language Arts. ‘[An] extraordinarily fine and moving book.’ —NYT. Milton Meltzer, a Christopher Award and Jane Addams Children's Book Award winner, is the author of over eighty books in the fields of history, biography, and social reform. His most recent books are The Amazing Potato, a 1993 ALA Notable Children's Book, Gold and Hold Your Horses!. He lives in New York City.